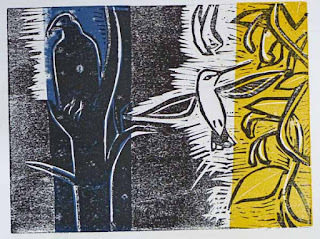 Ruby-throated Hummingbird and Turkey Vulture, Two-block Reduction Woodcut Proof by Ken Januski. Continuing on with the Work In Progess theme above you see the latest proof of the two-block reduction woodcut. I've added a blue to the color side of block, then printed the black block on top. I'll most likely carve away the black that overprints the blue, except for the Turkey Vulture, and let the blue show through. I may also add a second smaller blue area. At the moment the black still overprints most of the green in the lower middle and left. Most likely I'll carve away more of that too but that decision is on the back burner. After that I need/plan to add some red/orange/pink for the trumpet honeysuckle and Turkey Vulture head. Then I'll print the black on top and see what it looks like. Based on past experience I'll still be tempted to do more tweaking after that. I want the black to look integral to print, not some outline that is just plopped down as the last step. Savannah Sparrows at Dixon Meadow Preserve. Watercolor by Ken Januski. 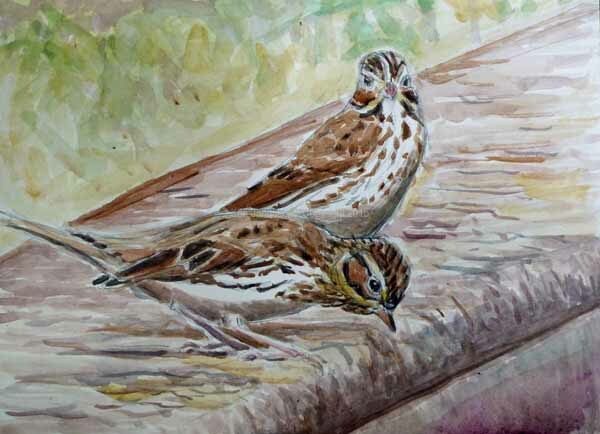 I did finally wade in watercolor on the pencil sketch of Savannah Warblers. This is based on a photo, and as so often happens with photos, it's easy to let the photo dictate too many decisions. In this case I stuck with the rosefish color of the railing at the preserve. Because of that the reflected areas on birds are more rose-colored than anything else. This gives an odd overall color to the watercolor. And perhaps the background could use a bit more definition. After the fact there always seem to be a million things that could be done to improve a watercolor. But almost inevitably, except in the hand of a master, they'll just deaden the watercolor. So this one is done. 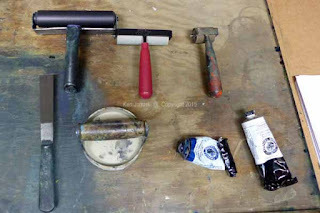 Brayers, Baren, Ink Knife, Ink, Inking Plate. Photo by Ken Januski. 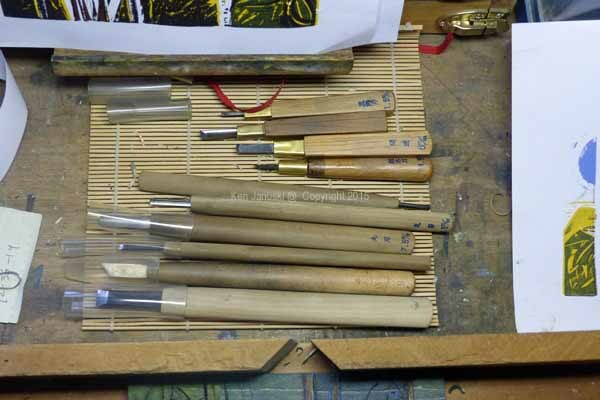 I was asked on Facebook to explain the tools and methods I use in my woodcut prints. So I'm adding those photos here. The ink is rolled on with brayers. Three of my cheaper ones are at top. I use a better one for the real print. They, an inking knife, a barren for rubbing the paper onto the block to transfer ink to paper, some ink and a glass inking slab are pictured above. Old Linoleum Blocks. Photo by Ken Januski. I mistakenly took a photo of old linoleum blocks rather than old wood blocks, but the photo above still gives a general idea. 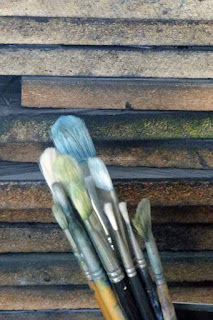 The brushes are for acrylic painting and have nothing to do with printmaking. They were just there, with nowhere else to put them. Carving Knives. Photo by Ken Januski. And finally my carving knives. All of those pictured above are Japanese. They are more expensive than some other carving knives and chisels but often you do yourself a favor when buying good tools. They are easier to use and often last a lifetime. Oddly enough the first one I bought was centuries ago, I believe in Berkeley, when I wasn't even doing woodblock printing. So I'm not sure why I bought it, especially as the cost would have been very high to me then. But I'm glad I did. Savannah Sparrows. Pencil Sketch in Progress by Ken Januski. 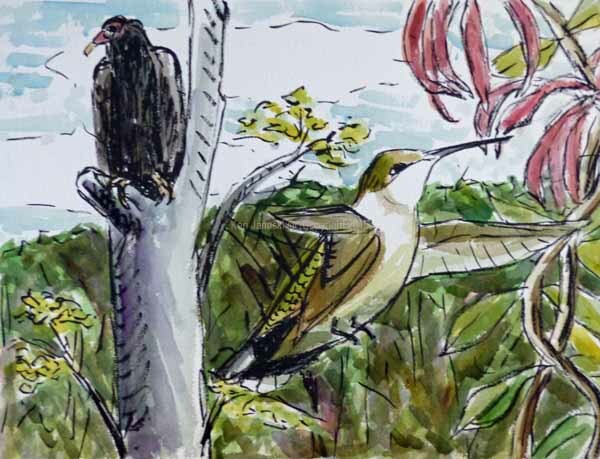 Ruby-throated Hummingbird and Turkey Vulture. 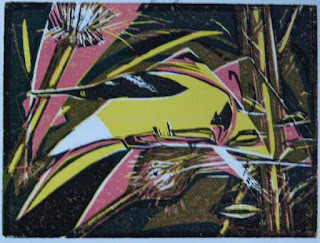 Multi-block Reduction Woodcut in Progress. Hmm. Is that the sound of some rare thrush, whippity, whippity, wip? No just a colorful, or perhaps just plain silly way of referring to two Works in Progess(WIPs). 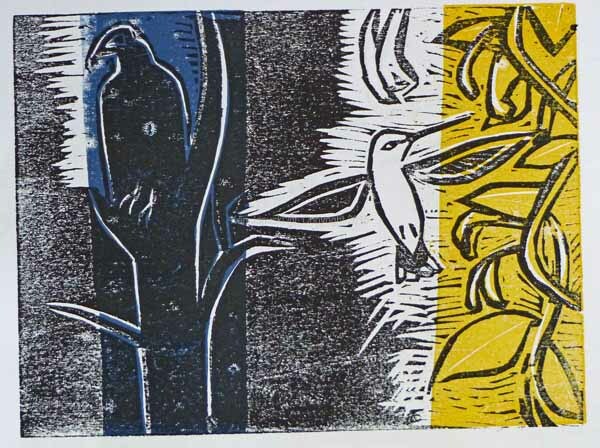 The more familiar work is the reduction woodcut the bottom image above. I've finished printing the yellow and brown on good printing paper. The green and the black are at the proofing stage. The black will print last but I need to proof it every once in awhile to see what it might look like at the end. As I do so I carve more of it away, as in the two arcs in lower left. There is more green than shows here because the black overprints it inside those two arcs. Right now I have to decide whether to include any other green areas. At the end I can decide whether or not I want the black to overprint or not. In any case I'm happy with it so far. Soon I'll print the green. Then I'll have to decide whether to add any blue sky. Most likely I'll end with a red/pink for some of the honeysuckle and the vulture head. Followed by black of course. The top image is something completely different: a fairly detailed pencil drawing based on a photo I took. Every once in a while I'll take a photo of a bird, especially one I'm not all that familiar with, and decide it would be good to make a study of it. 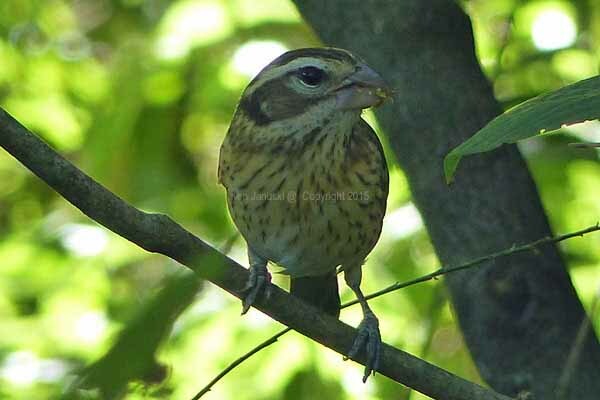 That's the case with these recently seen Savannah Sparrows. Most likely I'll eventually add watercolor. But when I do the entire work may turn to mud. So just in case here it is in a fairly clear state. It does lack, some views might note, the fine stripes you expect to see on a Savannah Sparrow. I'll add them eventually but first I wanted to get the structure right. American Goldfinch Eating Thistle. 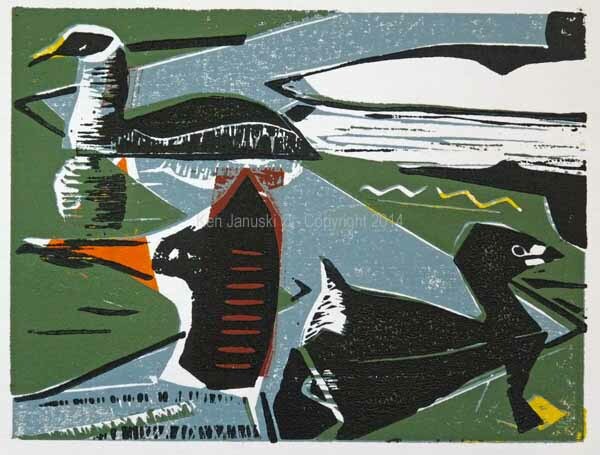 Multi-block Reduction Woodcut by Ken Januski. It's been two years since I applied to the Society of Wildlife Artist's annual exhibition, The Natural Eye. This was for financial reasons and nothing else. It had just cost too much money between entrance fees, shipping, courier fees and import tax in 2012 when I exhibited three works I believe. So foolishly I didn't apply the next year, which just happened to be the 50th anniversary, though I didn't realize it. To make a long and oft repeated story short I applied again this year. 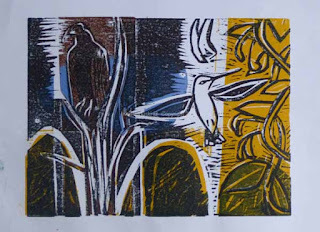 And I'm happy to say that the two reduction woodcuts above will be shown in the The Natural Eye - 2015. I believe it was also in 2013 that SWLA and Mall Galleries started showing many of the works in the show online. It's the type of wildlife art I really like and it made my absence all the more bothersome. I'm not sure if the works will be available online this year but I expect they probably will and I'll post something when I do. I don't buy too many books on wildlife art, partially because there's so much of it I don't like. But I'd guess 50% of the books that I do have are by artists who are members of the SWLA. I always have to tell myself I'm not dreaming when I realize that I'm exhibiting with many of the wildlife artists I most admire. 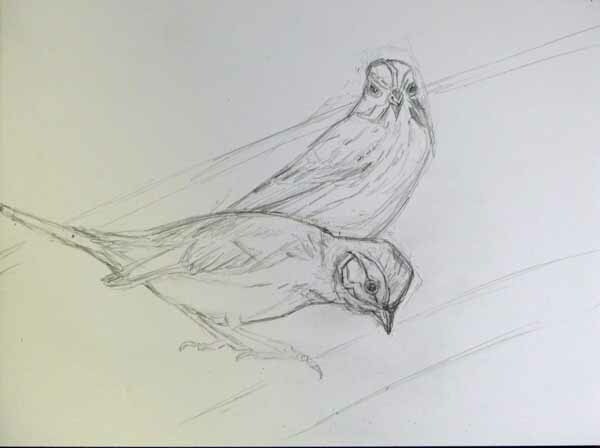 This is particularly hard to believe when I happen to look back at my very first bird art, done in late 2006. It was startlingly bad, though that is probably true for most people when they start to learn anything. Still I have to feel, even if only briefly, a sense of accomplishment nine years later, most especially for exhibiting with SWLA. Marbled Godwit and Lesser Yellowlegs. Watercolor by Ken Januski. It should have come as no surprise to me that as soon as I posted the last post about not working from photos that I'd experience a bird that I wanted to take a photo of, and that I wanted to portray using the photo. 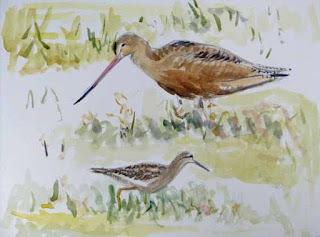 Such was the case with the Marbled Godwit above, our first one seen in Philadelphia, seen at Heinz NWR about a week ago. There were numerous yellowlegs around him and I've included a Lesser Yellowlegs in the foreground. I also started a sumi brush pen field sketch of the Marbled Godwit but no sooner had I started on it than some people stood in front of my scope in order to see the bird themselves. I'm sure that they didn't realize it so since we'd been there awhile taking up space that other observers might have wanted to us we moved on. But I was happy to get as much down as I did. Below him are some House Sparrows seen outside my studio window. 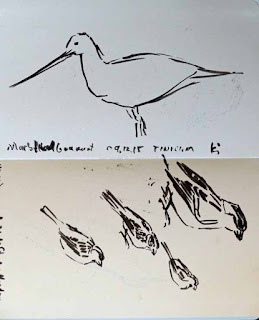 Marbled Godwit and House Sparrows. Sumi Brush Pen Field Sketch by Ken Januski. I'm trying to be a bit better about field sketches in my new sketchbook. 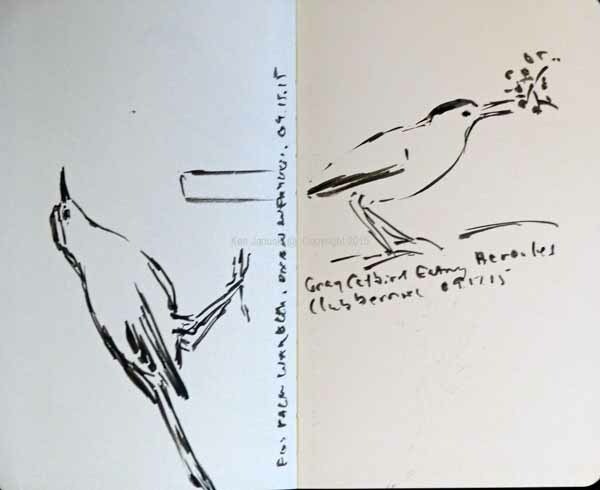 Below are two sumi brush pen field sketches from today and last weekend: a Gray Catbird eating berries from Hercules Club today, and the first Palm Warbler of the year, western race, seen at Dixon Meadow Preserve. I had to do the warbler from memory since he flew moments after I sat down and pulled out my sketchbook. Palm Warbler(western race) and Gray Catbird Eating Berries of Hercules Club. Sumi Brush Pen Field Sketch by Ken Januski. I have had a chance to use my new camera recently and so, in a very rare post, am showing some photos that I've taken. They should all be identified in the captions. 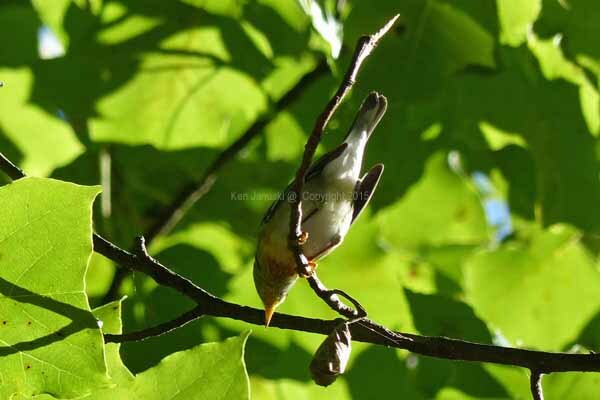 Upside down Northern Parula, seen along Wissahickon. Photo by Ken Januski. 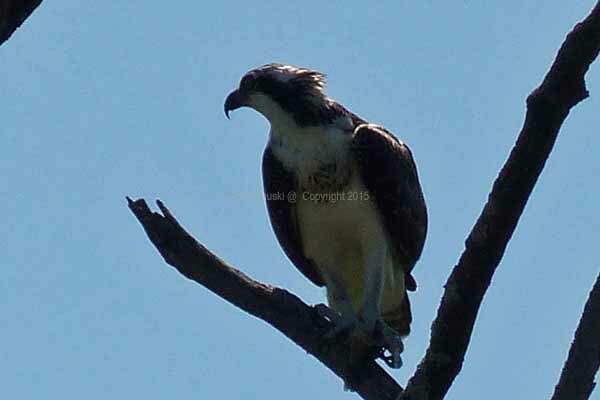 Osprey with Fish at Morris Arboretum. Photo by Ken Januski. Palm Warbler(western race) at Dixon Meadow Preserve. Photo by Ken Januski. Rose-breasted Grosbeak at Morris Arboretum. Photo by Ken Januski. Eastern Bluebird Eating Berries of Hercules Club at Houston Meadows. Photo by Ken Januski. Turkey Vulture and Ruby-throated Hummingbird. 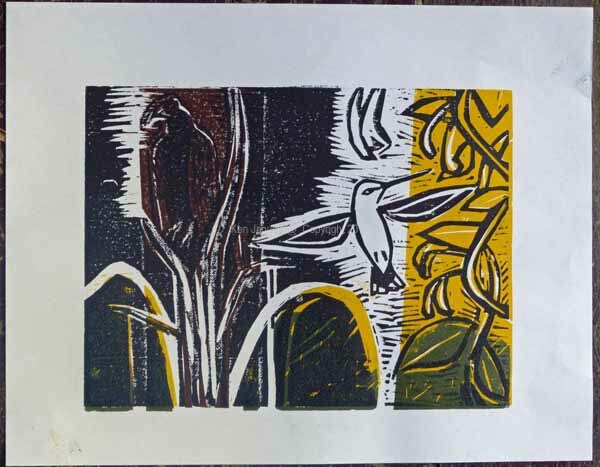 Two Block Woodcut, first proof by Ken Januski. Well after all my threats of returning to prints I've finally done so. The 6x8 inch woodcut above is in its earliest stages. I based the side of the block that will print black on my recent field sketch of a Turkey Vulture and Ruby-throated Hummingbird seen along the Manayunk Canal as well as another hummingbird seen the same day in our backyard. The other side of the block I'm printing in multiple colors, mainly as abstract shapes. As usual I can't say where this will go. 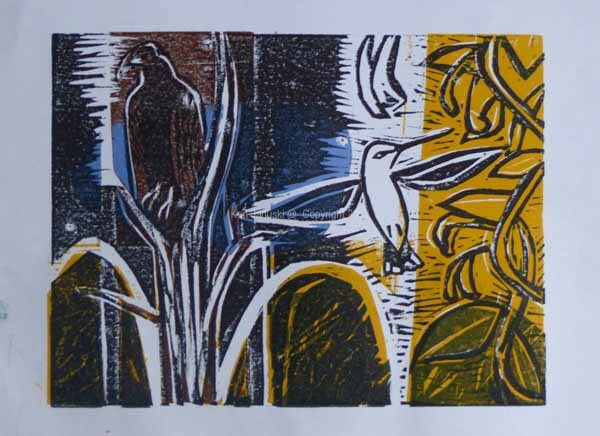 Though there are plenty of printmakers with a lot of plans as to how they will proceed I rarely have much of a plan. I trust my improvisatory skills. Sometimes they work and sometimes they don't. This also a reduction woodcut in the sense that each side will be treated that way. From the beginning I liked the idea of blue and white stripes. Who knows why or where it will lead. I think it's very difficult to do wildlife art and not want to make it realistic. Part of this is due I think to a very simple reason: artists find the wildlife attractive, in some way or another, and want to portray it. I understand this. But there are two problems here I think, at least from my viewpoint. First it is so easy to mistakenly think that photographs of wildlife are real. But they're not. Photos capture frozen instants, instants that we as humans never experience. We always see things in a living continuum not a frozen instant. So I much prefer 19th century realistic wildlife painters to most current ones. They seem less beholden and/or enthralled to photography. The other problem I think is one of knowledge. If you know a lot about your subject there's often a reluctance to not show that, to fear that someone else will look at it and complain about a missing tail feather in an eagle. I think it should be obvious to anyone why this type of thing limits the art that's possible. A number of years ago the Wall Street Journal ran a front page article on this type of art and the art collectors it inspires. It also mentioned what sticklers they often are about detail. If I remember correctly one complaint revolved around a button on a Confederate uniform. If that's what collectors want and artists feel the need to please them in order to make a living I understand that. In some way it's seem a healthy antidote to 200 years of the Romantic artist, working with himself as the only arbiter of taste. Nonetheless it leads to a very impoverished art. Imagine if music had such constraints on it. If so the weekly Lawrence Welk show, still on after all these years, might be the most revolutionary music around. In any case this is just a long winded way of saying that I always shy away from too much realism. 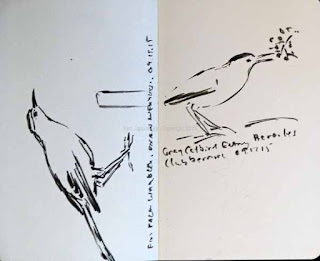 I see and value it in others and in field sketches. I do really like to know and understand the subjects I paint. But I'm much more fearful of the deadliness that can come about from both high finish painting and highly 'realistic' art. Both take away for me at least from art that is exciting and rewarding. So as you can see the new print at top does not have any problems with straying to close to realism. 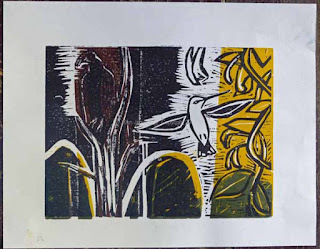 But it does give an artistic and expressive excitement that I hope I can develop in this print. As usual though with improvisation it's easy to fall flat on your face. Female Black and White Warbler at Manayunk Canal. Photo by Ken Januski. Last weekend my very old Panasonic Lumix FZ28 dies, after 7-8 years of great service. I never, ever care about getting artistic or well-composed photos. I use the camera for reference purposes, so that I can see perhaps the color of the feet on a Blackburnian Warbler, or the length of the primary projection on a mysterious flycatcher or to document an unusual bird, for instance a Worm-eating Warbler that we saw at Morris Arboretum a few weeks ago. Those photos were pretty bad but they were good enough to prove that the bird was seen. So I really don't care much about cameras. Nonetheless the new one I bought has a greater optical zoom than the one that died so I was anxious to try it out. I didn't see that many birds today, and the first ever backyard American Redstart from an hour ago wouldn't sit still. 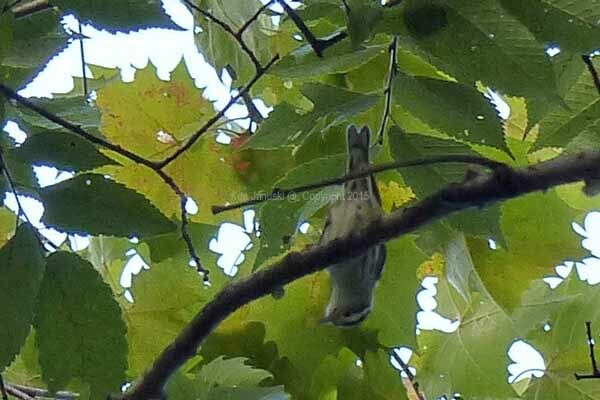 But I did get this passable photo of an upside down female Black and White Warbler. The other 4-5 didn't turn out but I was happy with this one. 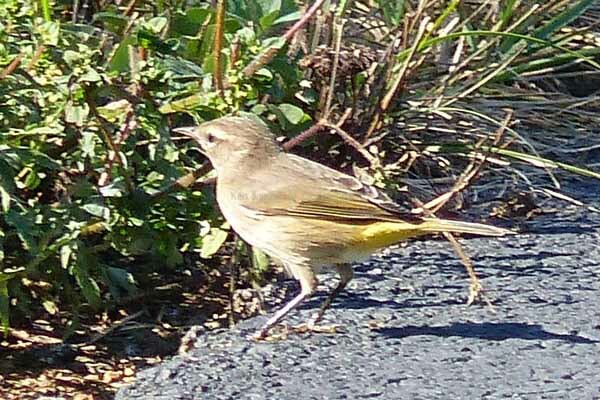 It's hard to believe that soon, well maybe not all that soon, the warblers will be gone until late March or early April. It will be like a day without sunshine. Turkey Vulture and Ruby-throated Hummingbird. Sumi Brush Pen Field Sketch by Ken Januski. 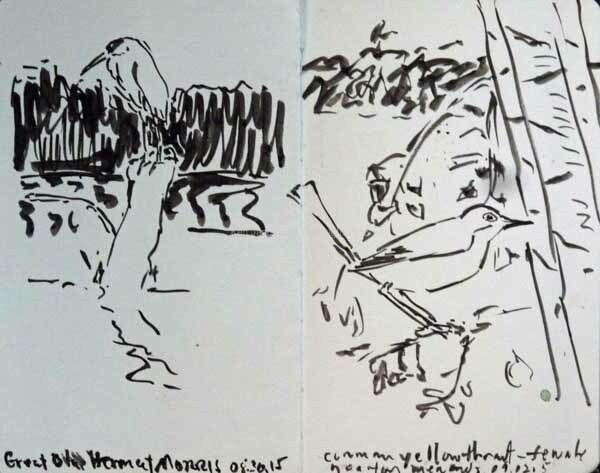 I'd guess it was a year or so ago that I vowed to try to do more field sketches during the coming year. I do 90% of them in a Moleskine sketchbook, mainly because that is the one sketchbook that fits comfortably in my back pants pocket. Over the last 5 plus years it has taken me about 14 months on average to fill one up, even though there are only about 100 small pages, counting each side of the paper as a separate page. But the last one took much longer. Thus my post about trying to do better this year. BUT guess what? Above are the last two pages of the sketchbook. On the left a Turkey Vulture with Ruby-throated Hummingbird below, an actual scene at the Manayunk Canal last week. 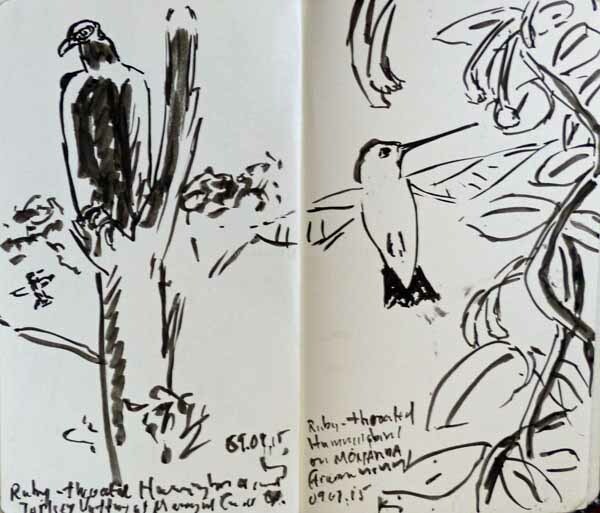 On the right a Ruby-throated Hummingbird at our trumpet honeysuckle in the backyard, done from memory. And it's almost 14 months since I started the sketchbook. I think if I hadn't switched to the sumi brush pen for most of my sketches it would have taken at least another month to finish. I do intend to continue with the brush pen though so maybe the next sketchbook will fill up more quickly. I guess another possible solution is to make sure that I don't take a camera with me! Turkey Vulture and Ruby-throated Hummingbird. Sumi Brush Pen and Watercolor Painting by Ken Januski. Though the sketchbook pages at top are different scenes I liked the way that they fit together. So I tried a new 12x16 sumi brush pen and watercolor painting based on them, though it's not all that likely that the trumpet honeysuckle would be growing in this environment. I also changed the hummingbird to one based on a photo I took a few years ago. I was reluctant to use it because though it showed many aspects of the hummingbird that I wanted to show it also had an odd perspective on the foreground wing. On the other hand it showed the fingers of the wing pivoting in a different direction that the rest of the wing, something that happens, though too fast to see, in most birds. So though I knew it might be very hard to read correctly I decided to try it anyway. I'm not quite sure it worked but nothing ventured nothing gained. I'm not thrilled with this painting but I do like the combination of subjects. 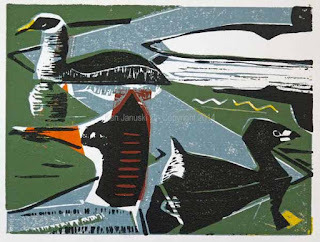 As I've written in the past, and a propos the recent John Busby quote, I often find that my best prints are ones based on unlikely scenes such as this, often rendered initially in a rather crude way. But the important part is not the detail, it is the entire scene. Photographic detail is rarely enough of an emotional stimulus to prompt a painting or print for me. To me it's sort of like watching TV and hoping to be inspired. A portrayal of an actual scene, though, even if crudely done, often has enough emotional resonance for inspiration. At least in my book(ALIMB). Common Yellowthroat on Birch Tree at Houston Meadows. Sumi Brush Pen and Watercolor Painting by Ken Januski. About a month ago we ran into some Friends of the Wissahickon Trail Ambassadors. 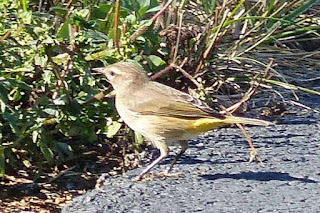 One of them asked if the Common Yellowthroats, which always seem so common at Houston Meadows, were scarcer this year. I said I didn't think so. But when I saw eight of them yesterday I had to reconsider. That is far more than I saw most of the summer. Were these migrants? Or were they maybe the offspring of the birds that had bred there just now making themselves more evident? I really don't know. 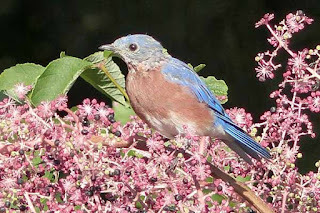 Perhaps we thought that there were a lot there but we mainly saw them in May and the early fall and didn't realize that they were scarce in July and August. I'm not sure. In any case I was struck by them and vowed to do at least one sumi brush pen field sketch. It is below, along with a Great Blue Heron seen along the Manayunk Canal recently. I've done a fair number of sumi brush pen and watercolor paintings this summer, pretty much to the exclusion of everything else. 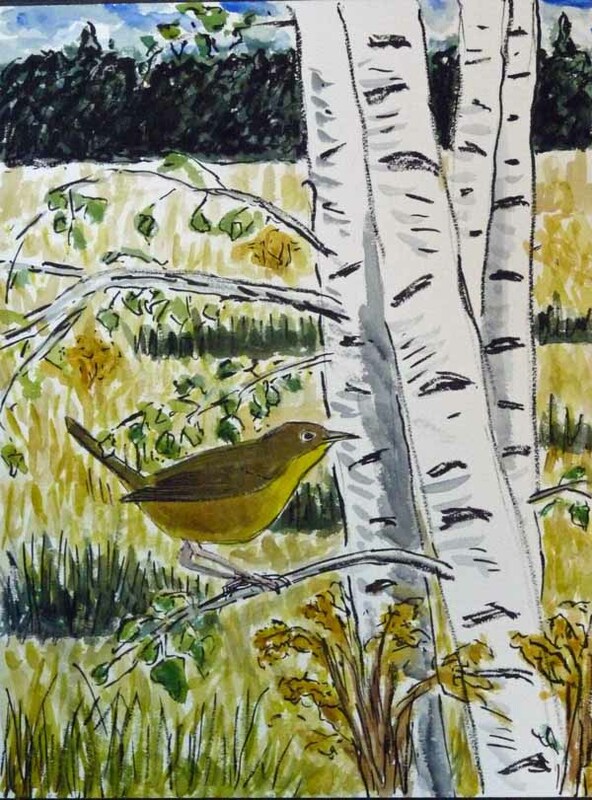 I thought that maybe I'd get back to prints after the 'Confusing Fall Warblers' sumi brush pen and watercolor painting. 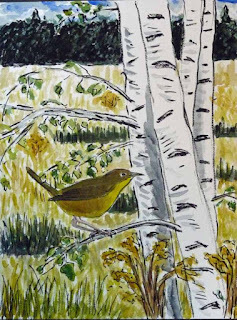 But I wanted to try out the Common Yellowthroat in Birches in those media. It may require some handcuffs on my wrists but I'm going to try my best not to do any more work on the painting. I'm always seeking to keep watercolors fresh, and then always managing to make them darker and muddier as I tweak them. I've already done a bit of that. But I'm going to do my best to leave this just as is. I think it will also work as a print. But I'm not sure right now whether I really will turn back to prints or just keep on with the sumi brush pen and watercolor. Why quit while I'm ahead? !